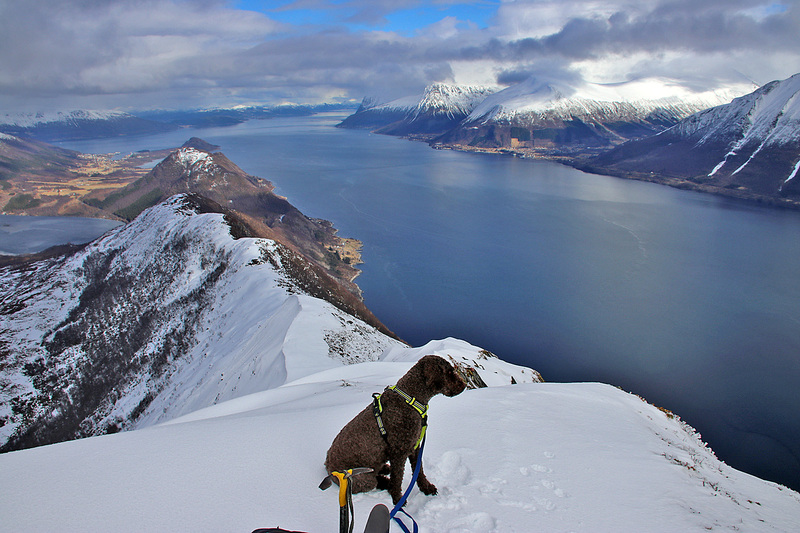 Monday; the hike across Saursegga and Gjøna is one of the finest walks on the Ytre Søre Sunnmøre islands. And when the weather is rough, the walk can be quite dramatic. 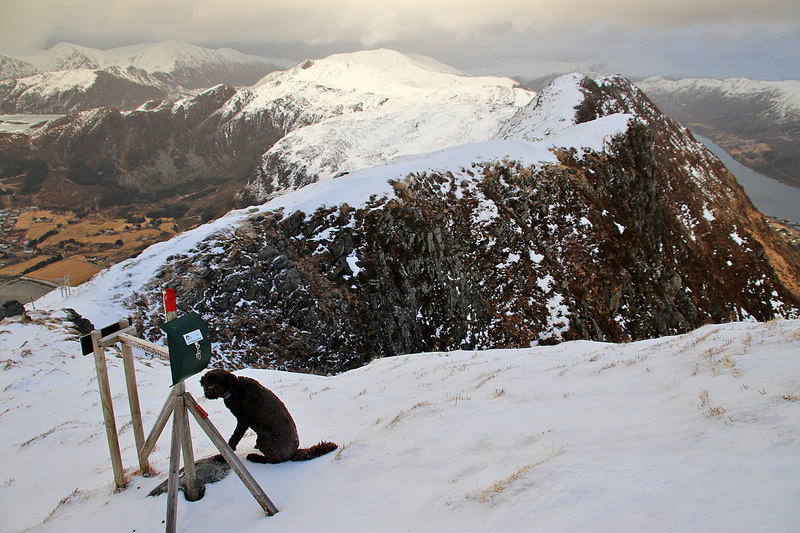 There’s not many places to hide when the weather hits you with full strength. I had noticed throughout the winter that there is far less snow on this mountain, compared to the mountains on the center of the island. As such, it was quite natural to choose hiking boot over skis today. 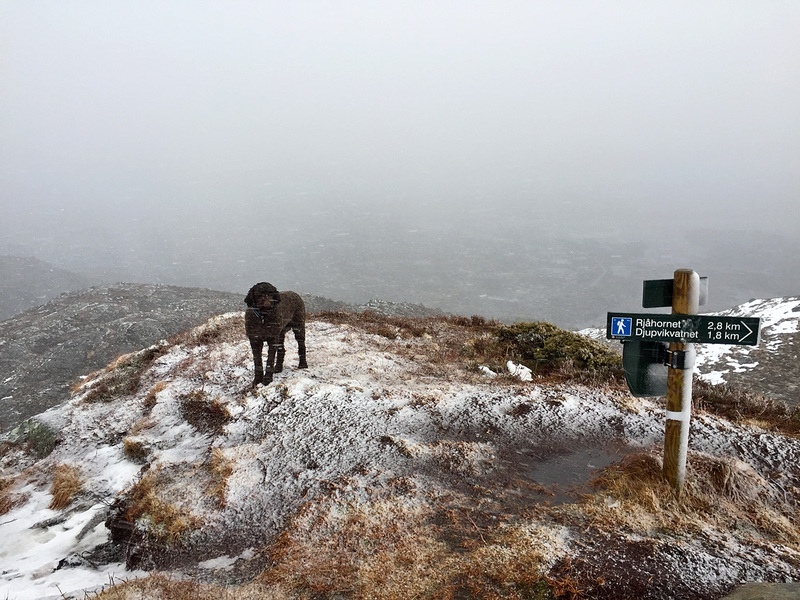 It was a snow shower day, and combined with a fairly strong wind, it would be best not to be in an exposed place when the showers came along. As the wind came from the north, I figured I could find shelter on the south side of the ridge. However, the ridge is quite steep in places, so we could be unlucky. 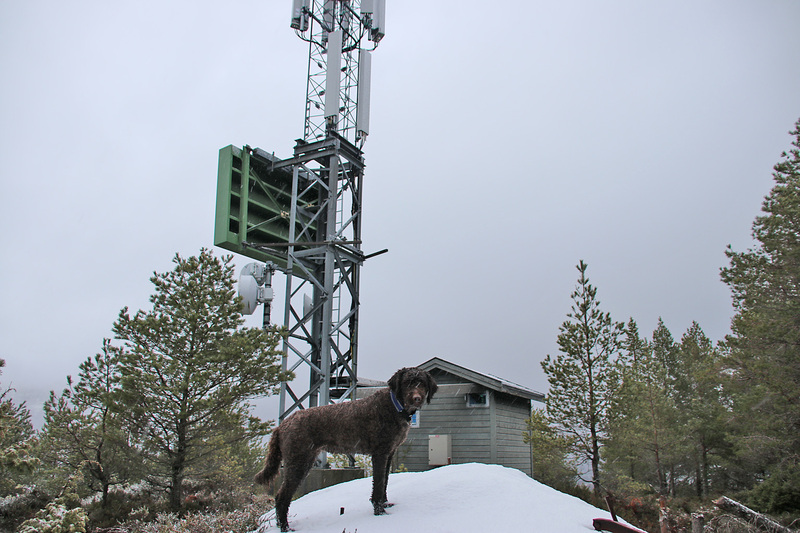 We didn’t reach proper snow until we were high on Saursegga, approx. 400m. Which is totally weird, as I could have skied from Leikongsætra (160m), only 9km to the east. The weather stayed stabile until we reached the col between Saursegga and Gjøna. Then I noticed a shower coming in from the north, at a high speed. Fortunately, there is shelter below Gjøna, and we stayed there until the shower has passed. The turbulence was quite strong, so we were both covered with snow afterwards. We hurried up to the top and back to Saursegga, where I started to relax. Another memorable trip to this part of the island! The trip: 6,9km, 730 vertical meters. In shelter, but a lot of turbulence! Tuesday; rain, rain and rain. I was dead tired after work and had zero motivation for hiking. But, the dog had to get its walk, so I aimed for the lowest top I could find – in the closest neighborhood – Eikenakken on Eika island. The trip: 7,2km, 380 vertical meters. Wednesday; more rain, more wind, but my fatigue after work was the same as the day before. It was a week of intense programming. I didn’t even have time to visit the office in Ålesund. Starting at 7am, finishing at 4pm, totally wacked in the brain. Good thing I have Huldrehornet close by. It’s not very high at all, but it is at least a walk. In the evening, I had to drive all the way to Olden (1,5 hour drive one way) to pick up Anne, returning from “boot camp” at Hovden (very, very far away). At least the drive home went fast, as Anne filled me in on the latest and greatest in ABC (airway, breathing and circulation) and avalanche rescue techniques. The trip: 4,5km, 250 vertical meters. Thursday; I only had a couple of hours between work and dinner with my colleagues in the evening. 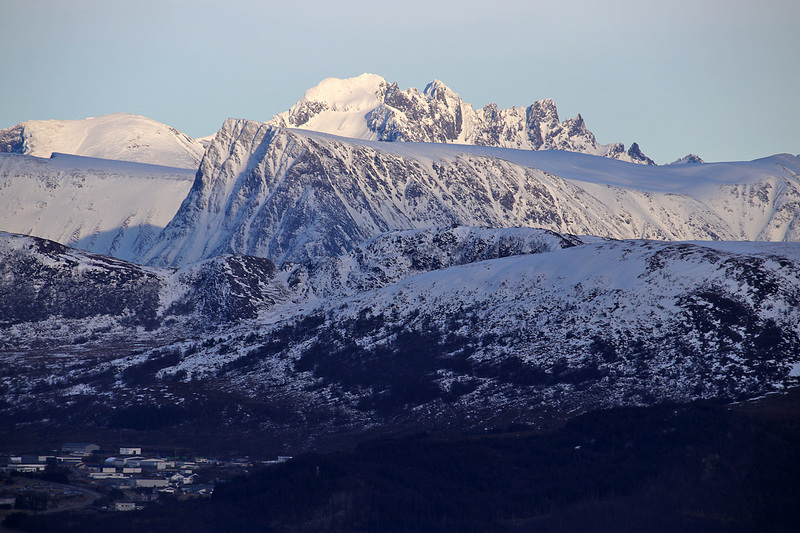 Enough time to visit Rjåhornet – another one of my local mountains. Karma and I headed out from Leikong, and instead of following the normal route, I tried something different. That was clearly a wrong decision. 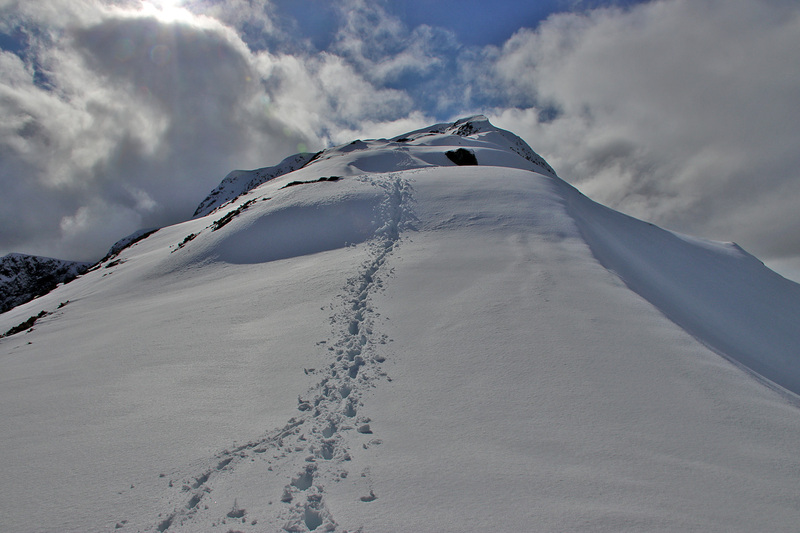 The route was both cumbersome and offered deep, rotten snow. 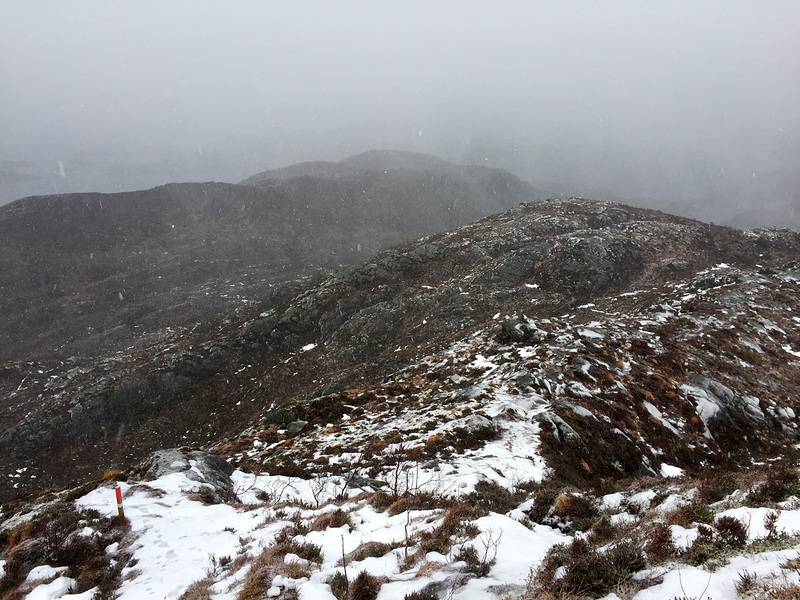 As we approached the top, the snow turned from rotten to icy. Probably within an hour or two, the ice would have become a serious problem (slide). But right now, I was able to crush through it. It looked like a planet of ice up there. It’s always nice to get to the top of this mountain. I really love it. The trip: 5,9km, 600 vertical meters. Friday; Anne left for Sogndal during the day, and when it was time to log off from work and take the dog out, the weather wasn’t half bad. But I had no energy left and I wanted to avoid the snow at all cost. 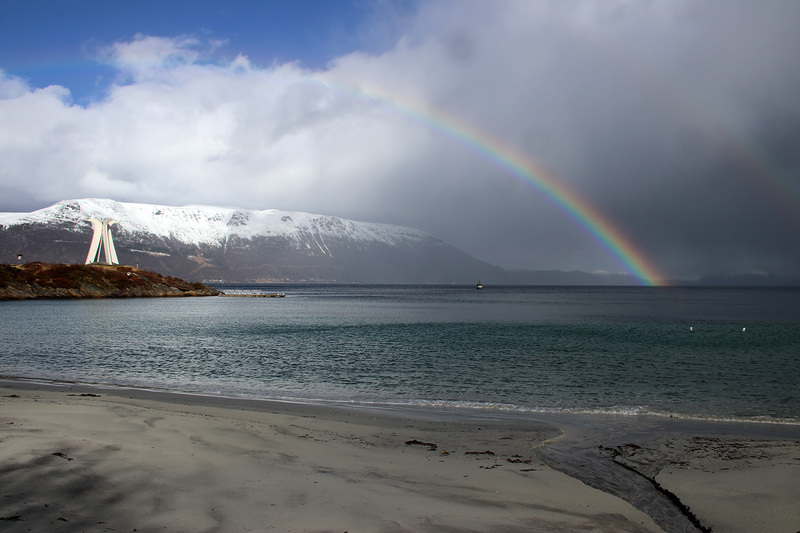 Leinøya was one of the places that offered a no-snow experience. As I hadn’t been to Leinebjørnen this year, I pictured a nice round trip hike which also included Leinehornet. Nothing much exciting happened during the walk, but I met a young man on Leinehornet, whom I walked down with. We had a good talk that span across mountains and politics. Very enjoyable! The trip: 7,7km, 500 vertical meters. Saturday; I had a faint plan to drive to Gjemnes (a long drive) to bag some new tops, but I woke up to the sound of rain. No way I would drive 3 hours (one way) to hike tops in rain and rotten snow. So, I decided to try to hike Skolma from Brandal instead. I reckoned the chance of making it was 50/50. Rain showers, combined with a strong wind is OK with me, but Karma doesn’t like being whipped. And we’re talking serious whipping! We headed out from sea level in Brandal, hiked up Ytredalen valley and fought our way through a messy forest (fallen trees everywhere) and rotten snow above the forest. 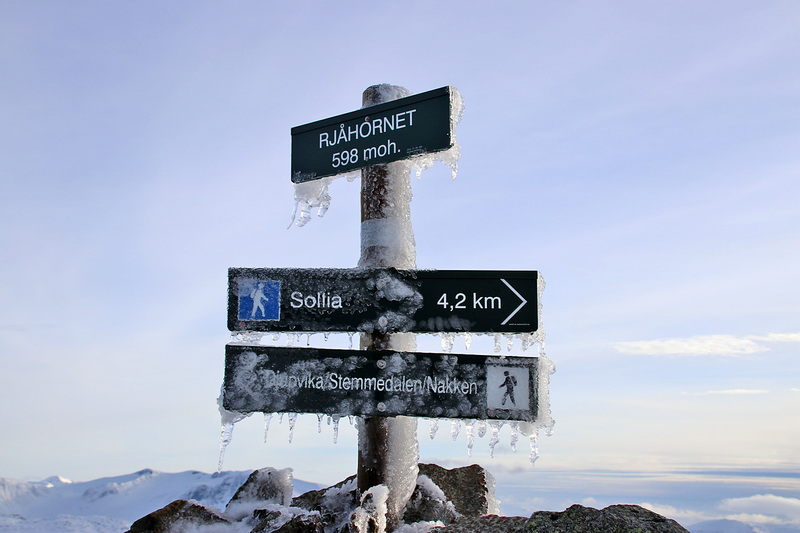 We reached the top of Grøthornet, and Skolma was now only 1,4km away. The problem was that I felt there was another shower moving in, and there was absolutely no shelter along the way. I decided that we should turn around, and it turned out to be a very good decision. On the way down, I decided to try my luck with the ridge dropping steeply down to Brandal. 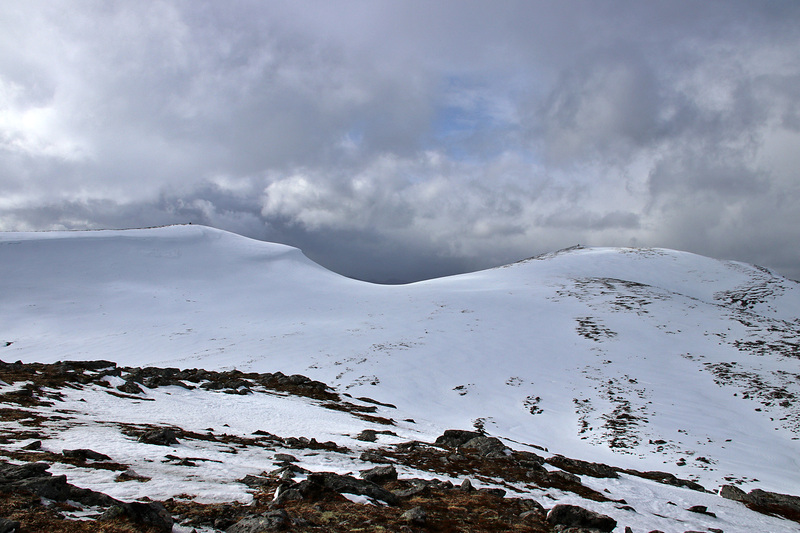 And then I found that there was a marked route down this ridge – Saudebønakken. This was a very enjoyable descent, even if the next rain shower had come upon us. The trip: 6,1km, 570 vertical meters. The trip 2,4km, 180 vertical meters. Sunday; what a way to finish a somewhat rugged weather week! I decided to pay Kongsvollen a visit, even though the avalanche danger was high. I planned to ascend a route I have never done before, but from a distance, I deemed it safe. If I was lucky, I would be able to descend the “Bukketrappa” route, making it a very nice round trip altogether. We had a mix of sunshine and snow all the way to the top. It had been a very nice walk, despite the hard work through the forest. When we got to the start of the Bukketrappa route, I figured that this would be doable. Careful steps, the first five minutes. Then it was just a matter of cruising down the ridge. The walk out the ridge was incredibly strenuous, because of the rotten snow. At least once per minute, I was in snow well above my knees. Karma also had to “swim” from time to time. Without gaiters (I couldn’t find them), I soon got wet feet, and by now, they were really, really cold. I had to stop every now and then just to drain the socks. Eventually, we returned to the car, and I could think back on a very memorable hike! The trip 8,4km, 570 vertical meters. Some beautiful landscapes and very nice photos!